The high-performance data center is built around IBM j-type e-series switches, m-series routers, and s-series firewalls. It is a new family of powerful products that help shape the next-generation dynamic infrastructure. IBM j-type s-series Ethernet Appliances perform essential networking security functions and are ready for next-generation data center services and applications. Designed on top of the Junos operating system, s-series Ethernet Appliances provide flexible processing scalability, I/O scalability, network segmentation, and services integration. 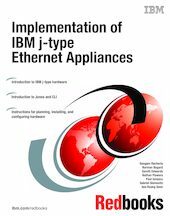 In this Redbooks® publication, we target IT professionals who sell, design, or administer IBM j-type networking solutions and cover the basic installation and maintenance of the IBM j-type s-series Ethernet Appliance hardware.